We have NEW BABIES available now! Welcome to Daphne's Dolls Cattery! 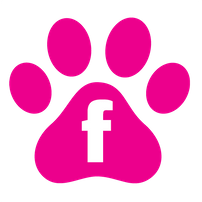 We are a small in-home cattery located in Gladstone Missouri. 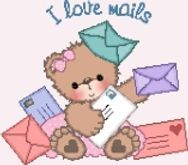 At Daphne's Dolls we strive to bring you the healthiest and most beautiful Doll Faced Persian Kittens you will find on the web. We breed our persian kittens for health, temperament and beauty. All of our persian kittens have the Traditional Doll Faced look - Sweet, chubby cheeks with bright eyes and a perfect little round face. Our persian kittens are handled from the day they are born and always have the most wonderful dispositions and personalities. We spend many hours cuddling and playing with each and every one of our persian kittens to ensure that they are well socialized and ready for their grand entrance into your hearts and homes. Most of our kittens are so laid back, they will flip over on to their backs to have belly rubs! Each persian kitten will have received between 2-4 baths by the time they leave the cattery and should be very familiar with the entire grooming process, including blow-drying. They are guaranteed to be flea and ear mite free before going to their new homes. Fleas and earmites should never be considered "common" in any breed of cat. They can be prevented and controlled if the proper steps are taken. All of our persian kittens come with a one year written health guarantee and come from 100% negative FeLV and FIV lines. Our breeding stock has each been DNA tested PKD negative, assuring that every kitten born here will be PKD FREE. 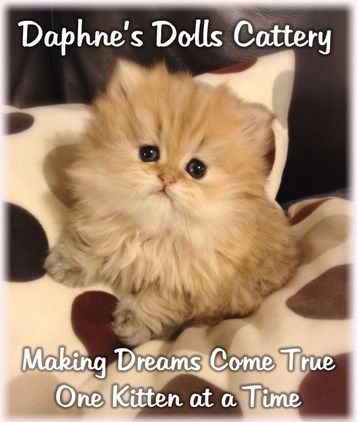 You can be confident you are receiving a healthy persian kitten when you purchase from Daphne's Dolls Cattery! We realize that every person has their own idea of what their "dream kitten" should look like when they are searching for their furry companion. Let us know what you are looking for and we will do our best to help make your dreams come true! Browse through our pages, and stay awhile! We hope you enjoy looking at our beautiful persian kittens and watching our adorable videos. When you spot that special kitten that will make your life complete, just give us a call at 816-377-1208 and we can arrange all of the adoption details!